Explanation: Why is there a spiral around the North Pole of Mars? Each winter this pole develops a new outer layer about one meter thick composed of carbon dioxide frozen out of the thin Martian atmosphere. This fresh layer is deposited on a water-ice layer that exists year round. 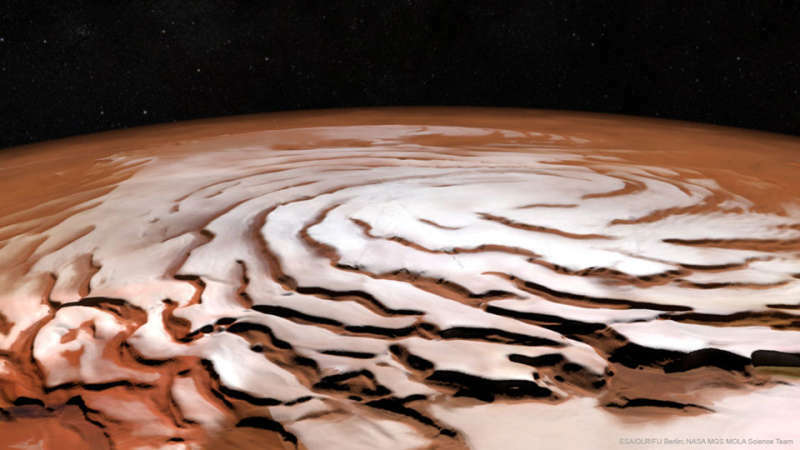 Strong winds blow down from above the cap's center and swirl due to the spin of the red planet -- contributing to Planum Boreum's spiral structure. The featured image is a perspective mosaic generated earlier this year from numerous images taken by ESA's Mars Express and elevations extracted from the laser altimeter aboard NASA's Mars Global Surveyor mission. New missions to Mars planned in the next few years include Insight with plans to drill into Mars, and ExoMars and the Mars 2020 Rover with plans to search for signs of microscopic Martian life -- past and present.